1. Cake batter. Mixed up. Poured in a cup. And served. 2. Sweetened Condensed Milk. From the can. Everyone got their own. I kid you not. This man actually exists. I did not make him up. Probably needs a great dental plan– but fantastic, all the same. I could drink it from the can. I wish I was kidding. Totally kidding. Consequently, I’m in love with all magic cookie bar recipes. And you already know of my love of Monster Cookies. Enter: Monster Magic Cookie Bars. PS- there’s no peanut butter, making them a little less “monster cookie-ish,” but I don’t think it would be hard to incorporate into the crust if you wanted to! In a zip top bag, crush the graham crackers using a rolling pin. Once crushed, add the 4 tbsp. butter to the bag. Place in the microwave and heat up for about 30 seconds. Remove from microwave, let out the air and make sure the bag is sealed (maybe let it cool for a second or two! ), and “mush” the butter and graham crackers together until fully incorporated. Press the graham cracker crumbs into a well-greased and parchment lined 9×13 baking dish. Evenly pour the sweetened condensed milk over the graham cracker layer. Sprinkle the oats, M&Ms, and chocolate chips evenly over the sweetened condensed milk and gently press in a little. Bake at 350º for 30 minutes or until browned and pulling away from the edges. These look AMAZING! You knocked it out of the park! Yum. Oh yum these look SOO good! I’ve never heard of a cookie bar recipe like this. Is sounds fantastic! The addition of chocolate chips and M&Ms is fantastic. Pinned! These look delish Ashton! I hear ya on the milk from a can, mmmmm. You mean it’s bad to slurp spoonfuls of that yummy milk? :-) Not that I do that or anything!!! I absolutely adore magic cookie bars…they truly are magical!!! And one with m&m’s is even better!!!! Looks very good! I pinned it. I’m not a big fan of oats…is there anything else I can substitute them with to make bars like this? Oh my gosh these look delicious! And I with that man was my Grampa!!! How fun would that be! These are definitely MAGIC cookies! I love magic cookie bars! Yum yum yum! I need to make these! How can I get that guy for a grandpa? Although, if push came to shove, I bet my mom would feed those things to Jordan if she didn’t think I’d get totally pissed. I’ve neve made magic bars. Must start with these! My mom totally would too. Lol. These look awesome! We just posted our Kitchen Fun and Crafty Friday link party and would love for you to share this! Oh my goodness, who wouldn’t love these! 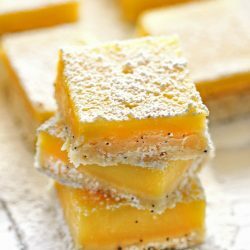 These look like something I need to make right now! Super Yummy! I would love it invite you to share these at my Creative Thursday Link Party (open until Monday) at http://www.michellestastycreations.blogspot.com. M&Ms and sweetened condensed milk. Love these! I really could drink sweetened condensed milk from the can. I love it! And we love the traditional Magic Cookie Bars. These ones look so good … I’m definitely trying them! man that is one smart grandpa, so going to remember that for when I am the “cool” grandma, my future daughter in law will hate me! Your monster magic cookie bars look fantastic! I’ll be forced to hide them from my son (more for me!) after I make them. I shudder to think about the sugar-high those kids must’ve been on after a little time with grandpa, but I bet they were good for him! Oh wow those look amazing! I wish I could have one right now! I would love for you to share this (and any other creations) at Pin It and Win It Wednesday @ http://www.cheapcraftymama.com! These could be dangerous. lol Yum!!! oh my gosh, this looks heavenly!! thanks for sharing! wow. these look sooooo goooooddd! i can’t wait to try them! thanks for sharing. These look amazing. Do you mean 9 individual graham crackers? I may have to make them this week ;). Thanks! I know, this is always kind of confusing to try and describe. So, 1 whole graham cracker = 2 squares. So 9 whole graham (rectangles) crackers…. did that make any sense? That is a dangerous recipe! I love monster cookies and making them into magic cookie bars is genius. I think I might add in peanut butter chips too! For more peanut butter taste add peanut butter chips or reeses pieces…Must make these tonight! Thanks for the recipe! If I am using graham cracker crumbs about how much would be equal to 9 graham crackers? Hi, I love your blog, thanks for sharing such fantastic recipes. 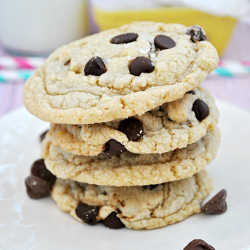 For some peanut butter goodness added I bet you could just swap peanut butter chips for the chocolate chips! I’m so trying this later today! Sounds so easy! Quick cooking oats or old fashion oats? It won’t make a huge difference either way, but if you have the option, I’d go with old fashion oats! Hi hon! I sure hope you come back to check the comments! You’re a no-reply blogger which means that I can’t shoot you an email with my response in it!!! These look delicious! Yummy. I love sweetened condensed milk a ton too…it’s so good! And can anything beat magic cookie bars? This looks like a fabulous take on them!! These were soooo good. However they are not coming out of my pan as a bar. What did I do wrong I wonder? They are to gooey and are not solid, but I’m not complaining. They taste the same and are wonderful. I’m just eating them with a spoon. Scary. I had the same problem. I did not follow the directions and didn’t use parchment paper. But even still, they were quite thin and gooey in the middle yet crusty on the bottom. I am eating them with a spoon but not easy to serve up if I were to share it with guests. Did I not cook these long enough (I do have an atomic oven) or press down hard enough? Okay, I’ll try that next time. The way I did not follow the directions was by using Pam spray instead of parchment paper. And yes, my oven is, to my shagrin, too hot. Thanks for the input. better to measure the crumbs… our 9 graham rectangles with butter would barely cover an 8×8 pan… had to crumb up more. Just pinned this. They look amazing. These look amazing! I’m thinking about giving up “real food” and just eating these, samoas dip and red velvet pancakes…. your recipes are so inspiring to get creative with our sweets! So much better than a store bought cookie…. Thank you! These were so easy and yummy! I did make one big change though: instead of just graham crackers for the base I used half crushed pretzels and half grahams. I wanted something salty in the mix and this did the trick. these are AM.AZ.ING!!! seriously. i made them for a cookout and they were devoured! i had more than i should have and couldn’t stop thinking about them! the 2nd time i made them i added peanut butter chips along with the chocolate chips. hard to believe, they were even better! (if you like the pb) thank you so much. i’m going to exp a little in making them lighter. my friend who’s son is allergic to dairy said you can use bananas as a binder and i’m going to sub some bananas for some of the butter. if that works, i may just try subbing it altogether. i’ve never done it before, so i’m not sure how it’ll turn out. thank you so much for putting this AMAZING recipe in my head!!! Those looks absolutely delicious! Where do you come up with these cookie recipes?! I love to make (and eat) layered bars like these and am so glad I found you through Brown Eyed Baker. Great blog! What size can of sweet condensed milk do you use? I made these tonight, only thing I changed was I added 3/4 cup melted peanut butter to the graham cracker crust mixture, YUMMY! These are wonderful! Finally tried these tonight. This is what I learned: yeah don’t skip on the parchment paper… some of the M&M’s melted and the candy coating solidified to the pan in some spots. Sprinkle the oats on first, some of mine ended up on top, so they never really soaked in and cooked. 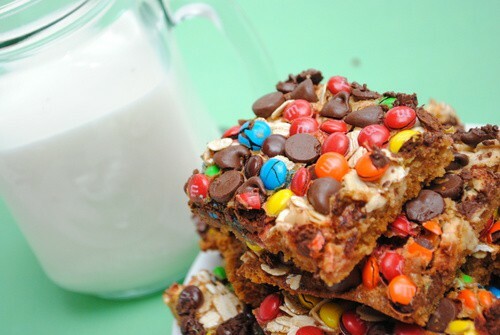 I ended up using 1/2 cup oats, 1/2 cup crushed pretzels, 1/2 cup butterscotch chips, and about 3/4 cup M&M’s. Don’t make these if you aren’t ready to share, you will keep eating them…. Great idea on the crushed pretzels!! Saw this on Pinterest on Wednesday, knew I had to make them for a bake sale this weekend, and made them on Thursday. Oh. My. I love this recipe and can tell you now it is going to be a “go to” recipe for me. I am so glad I did the Parchment paper as it made it so simple to pull out of the pan. I am having a hard time keeping them in the house long enough to bring to the bake sale tomorrow. Thank you! i am making these as we speak–using reese PB pieces on top to make them “fall” looking!! can’t wait!!! My mom used to make magic cookie bars, but we called the Hello Dolly’s… But OMG this adaption looks even more amazing that Hello Dolly’s. Def going to have to make some soon! how many ounces should the can of sweetened condensed milk be? Do u know how many cups of crushed graham cracker 9 crackers makes? I’m gluten free and have already gluten free graham and would like to use it. Thx!!! Will these stay good if you freeze them?